She wasn’t the last one to ask me that. I once memorized an official response; “a voluntary organization of business and professional men and women who have joined together for the purpose of promoting the general welfare and prosperity of the area’s business community.” Which is an accurate statement that doesn’t begin to tell the whole story. So now, after a quarter century of involvement with this organization, I’ve decided to elaborate. As long as commerce has existed; merchants and traders have banded together for protection against enemies or to govern the conduct of trade. The oldest known use of the term ‘chamber of commerce’ originally came from 17th century Europe, specifically Marseilles, France, but the European chambers have little in common with the modern American variety. The first local Chamber of Commerce on American soil was founded in Charleston, South Carolina in 1773, and records indicate there were only 40 such organizations in operation by 1870. Their role as true community organizations came much later as businessmen began to realize their own prosperity depended on the development of a prosperous community. Today there are 7,200 chambers in the U.S. that are as varied as the communities they represent. The San Clemente Chamber of Commerce first incorporated on the 18th day of December, 1928, in what is now the Historical City Hall building at the top of Avenida Del Mar. Signatures on the original articles of incorporation show a board of directors that reads like a who’s who of early San Clemente history. Founding fathers - Hamilton Cotton, Ole Hanson Jr., Tom Murphine and Hugo Carlson; street builder Oscar Easley; A. Travagalini, who owned the city’s first restaurant; along with names like Bartlett, first postmaster Latham, and Judge Warner, are inscribed on that first document. 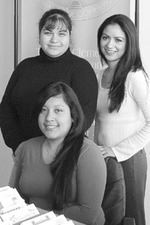 Standing from left; Norma Hernandez, Claudia Leon and Arlen Flores. In the early ‘60s the Chamber of Commerce and visitor’s center moved to its current location at the triangular intersection of El Portal and El Camino Real. The structure housing the Chamber was built and donated by Ray McCaslin and John Dahlstrom, on land leased from the city for the annual sum of $1. The Current Chamber is made up of 535 members, 17 board members, 10 standing committees and a paid staff of four. In November 2004 they received a coveted 4-star accreditation from the United States Chamber. They were one of 18 Chambers in the nation to be awarded. The principal Chamber fund-raiser is the well-known South Coast Area Directory (a staple by the phones of South Orange Countians) now in its 58th year. As a principal source of income for the organization it has helped it to maintain its independence from City subsidies. Other community and visitor publications produced by the non-profit organization include: a monthly newsletter, annual Visitor’s Guide, Dining Guide, a wall Calendar and a website. The Chamber is also well-known for its annual Fiesta, a downtown block party that has existed in some form or another almost every year since the city was born. Other events include: the Seafest Chowder Cook-off, the Taste of San Clemente, a Charity Golf Tournament and monthly networking Mixers. The Chamber maintains a very aggressive agenda for an operation with only four full-time employees. 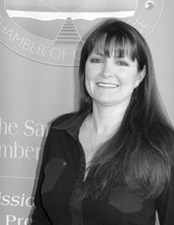 The San Clemente Chamber of Commerce is headed by CEO Lynn Wood. Lynn is a Sturbridge Village, Mass. native who headed west after high school seeking adventure. She attended the University of Alaska in Ketchikan, lived in Seattle for a time, and graduated from the University of Tuscon Institute for Organization Management before finding San Clemente in 1988. Lynn presides over a staff that includes: Norma Hernandez, Administrative Assistant; Claudia Leon, Administrative Assistant; and Arlene Flores, Customer Relations. The San Clemente Chamber is really just about people, a body of local business owners and officials. The majority live or work in the village and have found a level of fondness for the community that makes them want to be more involved in it. The San Clemente Chamber of Commerce can be reached at (949) 492-1131, the office is located at 1100 North El Camino Real.